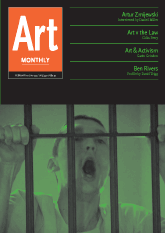 In this month’s Art Monthly show host Matt Hale talks to Art Monthly writers Colin Perry and Gavin Grindon. Colin Perry has written about artists who use the law as an artistic medium; something that can be manipulated and tested. He is joined by Gavin Grindon who writes about art and activism. Gavin Grindon has recently returned from the Climate Conference in Copenhagen and he tells us about the new forms of art and activism he saw out there. Special magazine subscription offer for Resonance 104.4 listeners. This entry was posted in Art Monthly Monthly, Shows, Uncategorized and tagged activism, after-war, anti-war, arnolfini, Art, art monthly, bike bloc, brian haw, colin perry, critique, free speech, gavin grindon, havana biennial, justice, kristina norman, laboratory of insurrectionary imagination, law, libertad, liberty, mark wallinger, matt hale, platform, protest, space hijackers, tania bruguero, venice biennale on February 16, 2010 by artmonthly.